For the human said to that forging was thought out 6,000 years before the ancient times, it is the manufacturing method of the indispensable manufacturing. However, discovery, mind zukigaarimasu which the technique is profound, and is still new. I developed the epoch-making idea that overturned common sense in us or applied to a mass production and supplied various products. Here, I introduce a part of technique. ※I increase when I click an image. Forging usually molds it by the pressurization from one direction (mainly the movement from the top to the bottom). 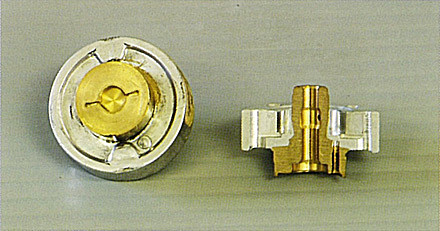 However, the growth of the pin does not maintain the same depending on a product like left photograph (2). Therefore I became able to keep growth by one process uniformly like left photograph (1) when I hung back pressure. Generally, the back pressure load was regarded as 3-4 percent need of the molding load, but I led the result called ten minutes by around 1-2% of only pressurization, and it was actually a mass production application possibility. Simultaneous compound forging of the different kind metal is a technique dealing with from the 1960s in us. They did it before for the purpose of the stronger combination of two kinds of products being important, but various requests doing increase in the different materials now because I keep lightweighting generally and use the metal which is strong because only a part keeps strength, and only a part changes a characteristic. In us, I carry out composition, fusion forging in not only metal but also the nonmetal materials such as resin and the rubber. Titanium, the forging product of stainless steel materials propel trial manufacture development, too. Depending on a use, a function of the new material can let suggest it. New materials development becomes popular. 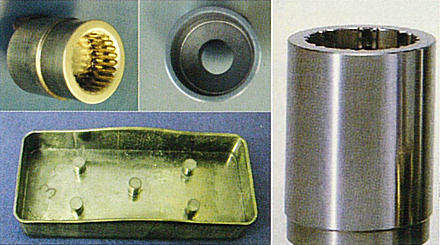 In us, I cooperate from development of the new material to forging. By the impact manufacturing method, even the shape that I connected more than two can produce a case by 1 process not a simple substance. In us, I make use of features of this impact molding, and there are the results that produced up to six built-in cases.